The travel moisturiser rehydrates the skin, leaving it to feel fresh and rejuvenated. Use in stuffy toxic environments, including offices, cars and planes. It is imbibed with cosmetically active botanical butters, exquisite oils, herbal extracts and skin balancing Australian bush flower essences. Organic Aloe barbadensis leaf juice, Organic Simmondsia chinensis (Jojoba) seed oil, cetearyl alcohol*, Organic glycerin, Organic Prunus amygdalus dulcis (Sweet almond) oil, glyceryl stearate citrate*, Coco-caprylate*, Organic Persea gratissima (Avocado) oil, glycerin*, Organic Rosa canina (Rosehip) fruit oil, Boswellia carterii (Frankincense) oil, Lavandula angustifolia (Lavender) oil, Pelargonium graveolens (Geranium) flower oil, Citrus aurantium dulcis (Orange) oil, Banksia robur essence, Callistemon linearis essence, Epacris longiflora essence, Patersonia longifolia essence, Crowea saligna essence, Thysanotus tuberosus essence, Eucalyptus macrocarpa essence, Ptilotus atripicifolius essence, Carica papaya essence, Nelumbo nucifera essence, Casuarina glauca essence, Eucalyptus caesia essence, Drosera spathulata essence, Ptilotus exaltatus essence, Organic Olea europaea (Olive) leaf extract, Echinacea purpurea root extract, Chamomilla recutita (Matricaria) flower extract, Calendula officinalis flower extract, Organic Arnica montana flower extract, Organic Cera alba (beeswax), Carrageenan (Chondrus crispus)*, xanthan gum*, glyceryl caprylate*, bentonite (clay), sodium anisate*, sodium levulinate*, potassium sorbate, tocopheryl acetate (Vitamin E)*, citral^, citronellol^,limonene^, geraniol^, linalool^. 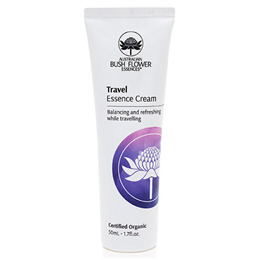 Below are reviews of Australian Bush Flowers Organic Travel Moisturiser - 50ml - Best before date is 30th June 2019 by bodykind customers. If you have tried this product we'd love to hear what you think so please leave a review.